4. Introduce a line with quantity = 254 price = 0.057035 and choose any non-zero tax from the drop-down. 5. Click on the button to calculate the taxes. The value of base from invoice is different from base of tax. 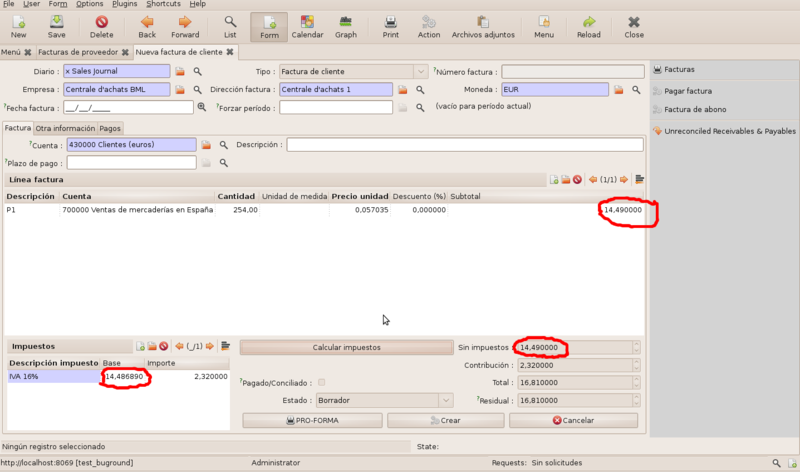 * The subtotal of each invoce's line is rounded to currency precission (in this case 0.01, two decimals). When calculating the base for taxes the base isn't being rounded. * Why the subtotal is recalculated to get the base for tax when we have a subtotal calculated field? Would you please apply the patch and notify us. Well, now base is rounded correctly but the result of base * tax is not rounded correctly. This causes that provider invoice is 141.54 and mine is 141.63. I agree, the 'tax_amount' did not get a rounded value. I have attached a patch which resolves both the issues. Please apply the same and notify us. Thank you for pointing out to this issue. 1. In invoice.py line 1243 val['amount'] is assigned to tax['amount'] IMHO this is the place to round tax['amount'] instead of doing the same operation in each branch of the conditional statement. It seems if you setting "price_accuracy=6", you want precision upto 6 digits. Then there seems no need for the rounding to be done as it will report accurate values. I think this should be the behaviour so I have refined the patch. Would you please apply the patch and notify us? JMA, one thing is *price* accuracy which means that products can have an accuracy up to 6 and another thing is my currency which has an accuracy of 2. Please be carefull on the fact you can have severals taxes on the same product/sale.order.line. For example, you can have VAT + WEEE (ecotax). May be subtotal of line should be rounded according to number of decimal in accouting, because it will be record in account.move.line. > For example, you can have VAT + WEEE (ecotax). > in accouting, because it will be record in account.move.line. > I'm using version 5.0.11. > non-zero tax from the drop-down. > 5. Click on the button to calculate the taxes. > The value of base from invoice is different from base of tax. Sorry if we don't have the time to fix all bugs, but this one will be fixed for the next release. Does it look like an issue of confusion whether to take accuracy of currency of price_accuracy? Is the patch in comment #5 approachable? I am investigating in order to get rid of such a high accuracy precisions. you have my response in #6, I don't understand the patch, seems crappy. I had a close look at the issue and have come up with a patch. There's just a slight modification, the amount value which comes is already rounded in tax_grouped values so just the base value had to be passed. We have undergone sheer tests for all the price_accuracy = 2,3,4,5,6. The values showed up perfectly. Please apply the patch and notify us. Trunk : 4245 <email address hidden>. do you know that the applied patch does not work? It still fails to calculate the invoice and tax bases, they're different. I have tested the patch from Eduard and it does work. Please, can you re-read (and understand!) the whole conversation and apply the patch from Eduard? And I suggest you to test your patches with prices that actually have more than two decimal numbers so you'll see how your patch fails.